A training, advice and support service has launched in Abbeyview, Dunfermline, to help local job-hunters into work. The Abbeyview Project, located in Allan Crescent, was officially opened by SNP MSP Bill Walker. It will provide an Information and Recreation Centre for the community, aimed particularly at young people. Mr Walker said: “People looking for employment can now access a variety of support, including assistance with application forms, CVs, interview skills and dress codes. Carnegie College is to provide education skills training in the Centre. There will also be provision of stationery, newspapers, stamps and the internet. 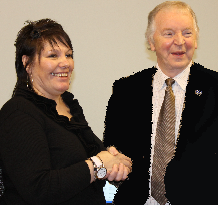 “Jackie Walls, the Centre Manager, has put so much into setting up The Abbeyview Project. Recently, the Big Lottery Fund awarded the Project a grant of £10,000, and I was glad to see such a worthwhile service receive support.